Celebrating teaching sailing since 1964, Offshore Sailing School is proud to have the longest running and most progressive sailing certification system in the United States. Steve Colgate who founded Offshore Sailing School, developed the curricula for our sailing certification courses, wrote our sailing textbooks, and was tapped to head the Training Committee for US Sailing, guiding a team of professional sailing educators in developing the US Sailing Certification System. Offshore Sailing School textbooks have been fine-tuned by Steve and Doris Colgate into the best educational tools for recreational sailing and sailing certification available today. Fast Track to Sailing, Fast Track to Cruising, and Performance Sailing and Racing are all published by International Marine/McGraw-Hill. recognition to Steve and his team. Steve has been intimately involved in the sailing industry, national and international ruling organizations and his own love – cruising and racing. He sailed in two America’s Cup trials, the Olympics, Pan American Games, six TransAtlantic Races, 20 Newport to Bermuda Races, and the list goes on. There is no other sailing school owner with such impeccable sailing credentials. 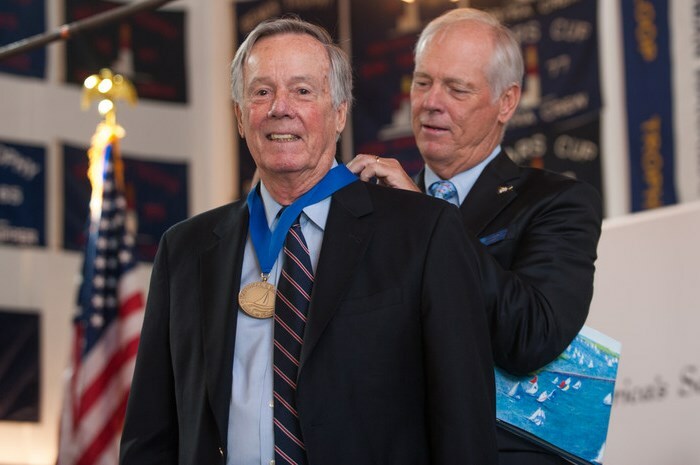 And no other sailing school owner or operator inducted into the National Sailing Hall of Fame (seen with Gary Jobson here at the 2015 induction services). Given all the ads and hype out there, many ask “what is the true value of sailing certification?” The reality is the recreational sailing certifications available in the United States are not legally required; nor is a sailing certificate necessary for chartering or renting boats in the United States and Caribbean. However, you do need an International Proficiency Certificate for chartering abroad in Croatia, Greece and other areas, which you can order through US Sailing after passing the US Sailing Bareboat Certification exam. Offshore Sailing School is the official sailing school for The Moorings – enjoying a partnership since 1973 with the world’s pre-eminent charter company. All you need are strong skills, confidence and knowledge to sail your own boat or charter from a reputable company. And that is what you will always get from Offshore Sailing School. The real value in sailing certification is the personal validation you get from a job well done. Test sails at course end are proof perfect that completing an Offshore Sailing School course is a job well done. This has been a mandate of Steve Colgate since the beginning. He is the pre-eminent sailing educator in the world, still at the helm of our company and wowing the industry since 1964. Every course noted below has textbooks that far exceed the depth of information found in other books for similar courses. Most gratifying are the comments that come from our graduates, many of whom are top educators, professionals and leaders with years of training experience in their own fields. We urge you to read the textbook before arriving for your course; you will be far ahead of the curve and very comfortable on your first day out if you do. US Sailing’s mission is to provide leadership for the sport of sailing in the United States, ensuring that first-time and advanced sailors learn from experienced and certified instructors who follow national guidelines and are trained using a nationwide curriculum. Steve Colgate set those standards when he was asked to lead a team of sailing educators to develop a national certification standard, system and curricula for commercial and community sailing schools in the United States. You are not required to take sailing certification tests proffered at the end of an Offshore Sailing School course. However, most do because it provides validation of how much you have learned. All we ask is that you have the proper prior experience and skills for the course level you choose if you are looking for a course beyond Learn to Sail; and that you have a wonderful time and learn more than you ever thought possible. You may enter the US Sailing Certification System in courses beyond Learn to Sail through a resume and discussion with our Director of Operations. If you are seeking certification, during your course you may “challenge” the prerequisite course level and take that test. We highly recommend you take the Fast Track to Cruising® course if you have basic certifications and want one of our cruising courses. This will guarantee your participation on an equal level with other Offshore Sailing School graduates. If you plan to charter in Europe or other areas overseas, you may be required to show your certification certificates and an International Proficiency Certificate. 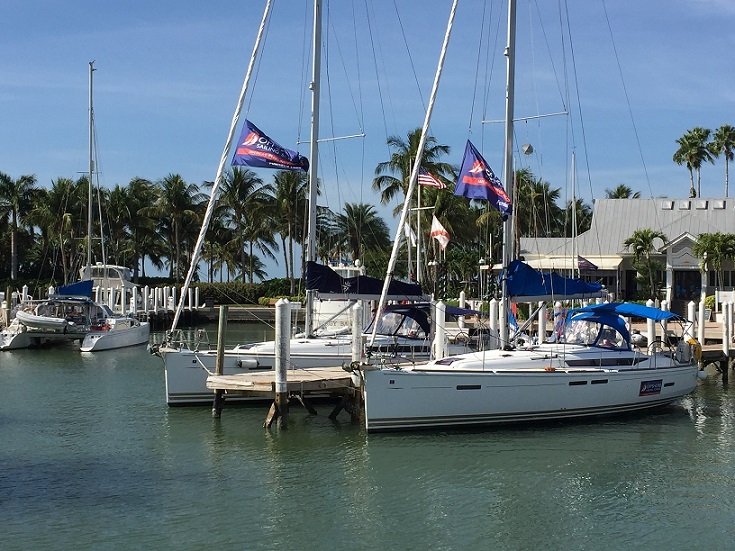 US Sailing, the governing body of sailing in the United States, will issue this certificate for a nominal fee for U.S. citizens who have achieved US Sailing Bareboat Cruising Certification and US Powerboat Certification. For more information go to https://www.ussailing.org and search IPC.